Our five star customer service, highly skilled craftsmen, and sterling reputation for doing the job right makes Village Builders your best choice for building your new home. Family owned and operated since 2007, we have never lost sight of what is most important to you, our valued customer. The highest quality of work, attention to details, experience in all aspects of home building and finishing. 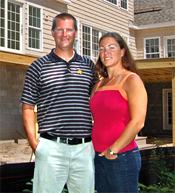 Village Builders employs local craftsmen who appreciate the history and peaceful lifestyle of the Eastern Shore. Village Builders uses many different building styles and techniques to build quality dream homes. Our most preferred method is a system which allows us to quickly and in a very cost efficient manner construct modern, highly engineered, high quality homes for each Client. The Village Builders construction system combines the best aspects of on-site conventional construction with the best aspects of off-site modular construction to create the home of your dreams. Village Builders system built homes are built only to our clients order and are generally completed in 60 - 90 days after order placement. Indeed, our best time — from to move in day to order placement— was 58 days! • We are a locally owned and operated builder of fine, affordable Custom Built homes. • Our homes are backed by substantial financially competent companies. • Third party 10 year warranty is available on all of our homes. • The aesthetics and livability of our homes are unsurpassed. • Our homes are built as lifetime homes. For example they are built with all 2 by 6 studs in the exterior walls and concrete block foundations. • We are licensed as a Virginia “Class A” contractor; License number 2705116099A. • We are a family owned and operated business from the Eastern Shore and we will be here for a lifetime of service dedicated to all of our clients needs. Just ask any of our clients. • Most importantly, we want your business and will do what it takes to fulfill your wishes. Others may build cheaper homes — and charge accordingly— but in the quality home market we will not be undersold! • Last but not least we are growing company that will never forget our clients become our life long friends. Make Village Builders your partner in realizing your dream. Click below for more details. Our beach house was completed on time and under budget. It is everything we dreamed of. Thank you!